Partial view of Ballesta Centro Island. 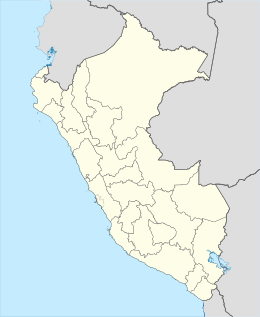 The Ballestas Islands (Spanish: Islas Ballestas) are a group of small islands near the town of Paracas within the Paracas District of the Pisco Province in the Ica Region, on the south coast of Peru. Sea lions at Islas Ballestas. Composed largely of rock formations and covering an estimated area of 0.12 km², these islands are an important sanctuary for marine fauna like the guanay guano bird, the blue-footed booby and the tendril. Other notable species include Humboldt penguins and two varieties of seals (fur seals and sea lions), amongst other mammals. These islands are accessible from the resort town of Paracas (near Pisco) by tour boat which typically lasts 2 hours. During the visits it is not uncommon for the sea lions to approach the tourist boats and make spectacles for the visiting tourists. On the way to the islands, on the Paracas Peninsula, visitors will notice El Candelabro, a large-scale geoglyph that may have served as a beacon to mariners. The mystery as to the origins of this particular geoglyph is ongoing with much speculation. The visit to the Ballestas Islands is, from an ecotourism point of view, probably the best known along the Peruvian coast. ^ Riley, Laura; Riley, William (2005). Nature's Strongholds: The World's Great Wildlife Reserves. Princeton University Press. p. 565. ISBN 0691122199. ^ DK (2014). DK Eyewitness Travel Guide: Peru. Penguin. p. 122. ISBN 9781465432476. ^ Box, Ben; Murphy, Alan (2001). Peru Handbook: The Travel Guide. Footprint. p. 290. ISBN 9781900949842. ^ Lonely Planet’s Discover Peru: Top sights, authentic experiences. 1786575191 Lonely Planet - 2017 "Protruding out of the Pacific Ocean, the Islas Ballestas are home to an astonishing number of sea lions, birds and fish." Eduardo, Andrés; Montoya, Toro (2011). "Pelícanos de Islas Ballestas" [Pelicans of Ballestas Islands]. Medicina U.P.B (in Spanish). 30 (2): 119–20. Hughes, Holly; Murphy, Sylvie; Flippin, Alexis Lipsitz; Duchaine, Julie (2010). "Islas Ballestas: Peru's Pacific Playground". In Reilly, Jennifer (ed.). Frommer's 500 Extraordinary Islands. Hoboken: Wiley. pp. 116–7. ISBN 978-0-470-50070-5. Wikivoyage has a travel guide for Ballestas Islands. This page was last edited on 19 November 2018, at 18:44 (UTC).